Now available, the OFFICIAL app for Baptist Hymnal (2008)! This FREE app includes over 200 of your favorite hymns with full lyrics and four-part vocal lines. Created from the same master files used for the printed edition, this app includes access to all of the same great features you have in the hardcopy book, plus some digital-only features! search for hymns by title, writer, lyric, topic, and more! 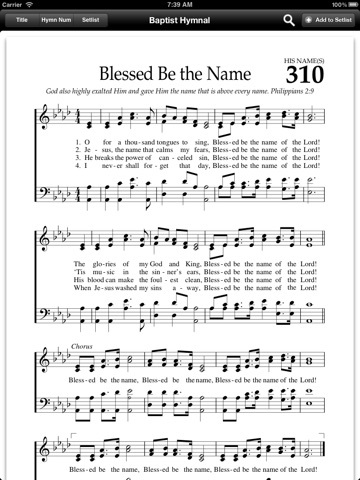 tap the title or hymn number you want and jump right to the hymnâ€¦ no fumbling for pages. zoom in to the page to see lyrics and notes at the size you needâ€¦ great for older members in your congregation who have trouble holding the heavier book or seeing the notes. no Internet connection required once the app is installed. SPECIAL OFFER: for only $9.95, you can purchase the rest of the 674 hymns and contemporary worship songs included in the printed edition, right from within the app! Thatâ€™s 28% off the regular printed hymnal price! Whether youâ€™re a worship planner, a worship team member, or you just love to see the notes to the song youâ€™re singing, this app is for you!